Handsome dark brown (maroon) herdsire from Wilkins Livestock. One of our retired foundation herdsires. Producer of beautiful colored crias. Caliope is one of our top producing foundation females. She consistantly has dark colored crias with exceptional luster. She is 2nd generation out of Sudden Impact on the sire side. WLK Obsidian King is our true black, 3/4 Peruvian 1/4 Chilean, premier herdsire that we co-own with Flying M Ranch in Sylvia, KS. We purchased him from Wilkins Livestock. King's halter show career had ended about the time we acquired him, but it was illustrious and included a Championship win over the highly-regarded Sniper, who had more Championship wins than any other black Suri male in history. 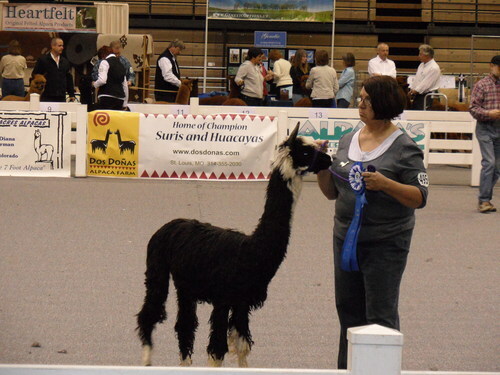 We continued to exhibit his fleece through 2011, and he won his class in every fleece show he was entered in. He is rock-solid, conformationally correct, and produces offspring with beautiful luster and density. King has sired 20 offspring for both ranches, an even 50% male:female, and 100% Suri. His babies have been white to true black. And they've all been wonderful. Killer Queen (Queenie) is a very flashy multi-color girl with a solid true-black blanket that is dripping with luster. She represents one of our best results in crossing the Fruzane Noir x Sudden Impact bloodlines. She has very long legs and neck, but is rock solid and has been awarded many blue ribbons for what she brings to the showring. She is bred to our true black herdsire WLK Obsidian King for her cria, due in Fall 2016. This is a great opportunity to add sought-after Chilean cornerstone genetics to your herd.